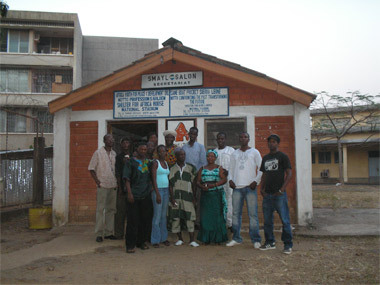 Sameboat Project Sierra Leone now has over a 100 members and an office in the National Stadium, from which outreach projects seek to engage local people through theatre in activities designed to strengthen their communities and create opportunities for economic and cultural development. In March 2008, Amistad Heritage International and Sameboat Project Sierra Leone commemorated the 201 years of the Abolition of the Atlantic Slave Trade at a press conference held at the Amistad Heritage office, Fort Street, Freetown. Executive Director of Amistad Heritage International, Mr. Samuel H. Pieh. said the slave trade past and present was a gross abuse of human rights. He said victims of slavery are often also sufferers of psychological enslavement and added that slavery anywhere is a threat to human freedom. "The struggle against slavery should be everyone’s business," he said. Mr. Pieh went on to state that slavery is not yet over and that the act has only been modernized. Concluding, he said the 201 year celebration was more about sensitizing people about mental enslavement. Also speaking was the Organizing Secretary, Mr. Ernest Luke, who stated it is time for Sierra Leoneans to free themselves from mental slavery.